In Castillian Spanish ‘Soto‘ is the word that describes a thicket, a copse or grove and ‘grande‘ of course means large or big, so once upon a time, probably not so long ago, this whole area was woodland. Much of that woodland has been cleared to make way for the roads, golf courses, villas and other constructions, but stretches of Cork Oak woodland remain intact, many large cork oaks have been retained within gardens and on the golf courses and others have been left undisturbed on plots not yet built on. Hundreds more trees have been planted for decorative and shade purposes and have created a habitat that I suppose may be loosely described as open mixed woodland. It is a mix that adds pines, cypresses, palms, acacias, figs, rubber trees and many other ‘exotic’ species to the indigenous species of cork oak, stone pines and even the occasional strawberry tree (arbutus). A rich tapestry has been created that is beautiful to look at from a human perspective and provides an interesting and productive habitat for many species of woodland birds. In the following pages I have listed some of the trees that are most widely planted. 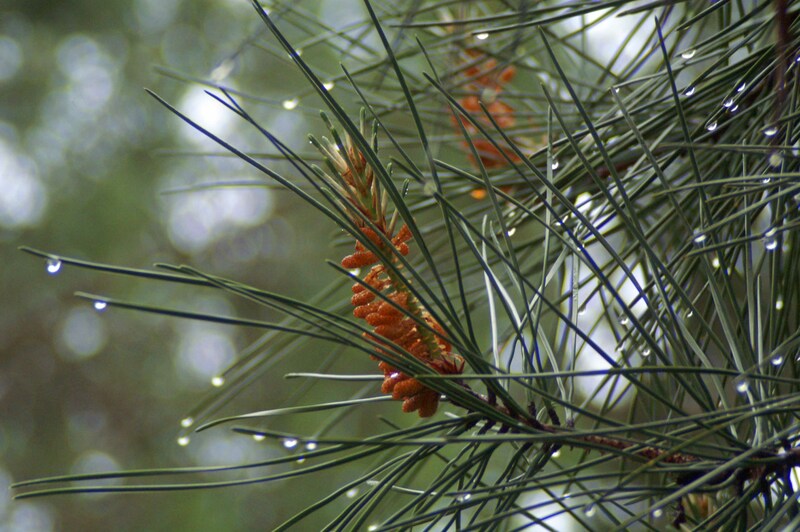 Pines are evergreen trees with spirally arranged needle-like leaves that are borne in clusters of 2,3 or 5. 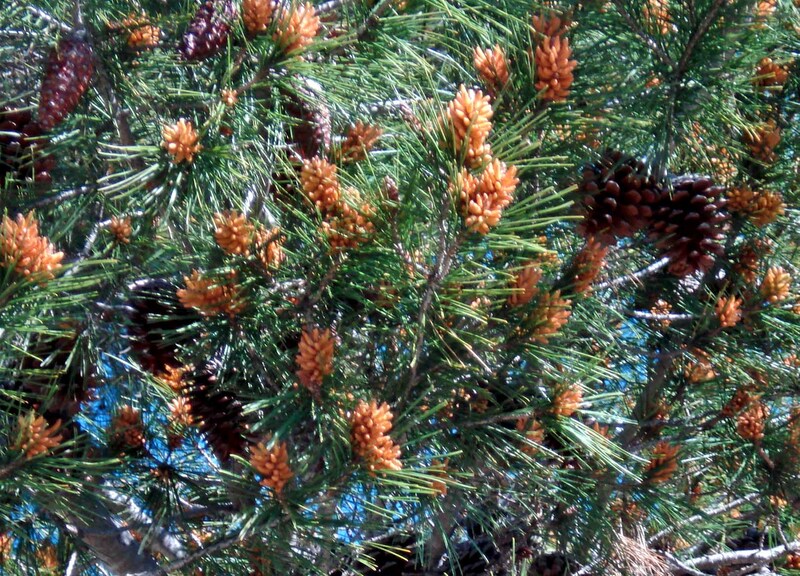 The male flowers are borne in small cones at the base of young shoots and produce copious amounts of pollen.The female cones, produced on the same tree, are much more substantial, borne initially at or close to the shoot tips and take one or several years to mature. 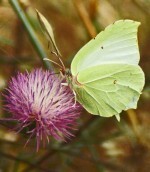 Seeds are often, although not always, winged. 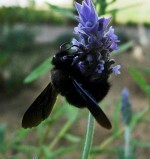 Many species are cultivated throughout the region, and I have described those most commonly planted. 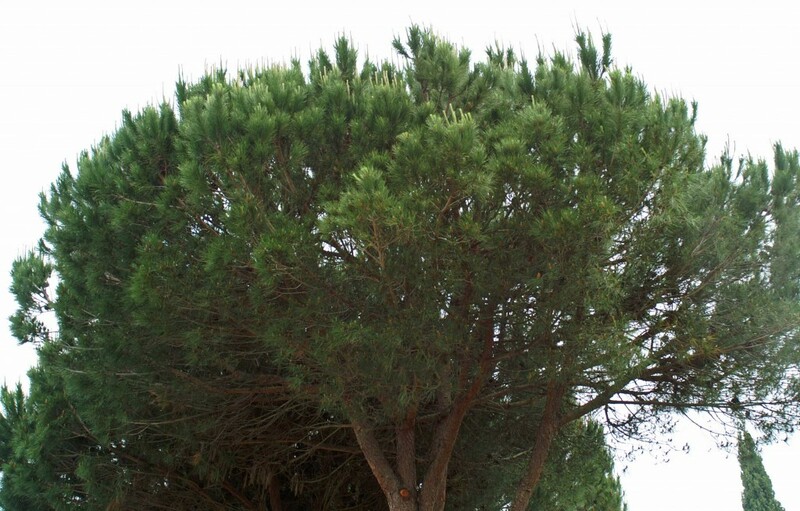 The Stone Pine is a large, majestic tree that may attain some 30m in height when mature; characterized by the domed shape of its crown that gives rise to the tree’s other name, the Umbrella Pine. 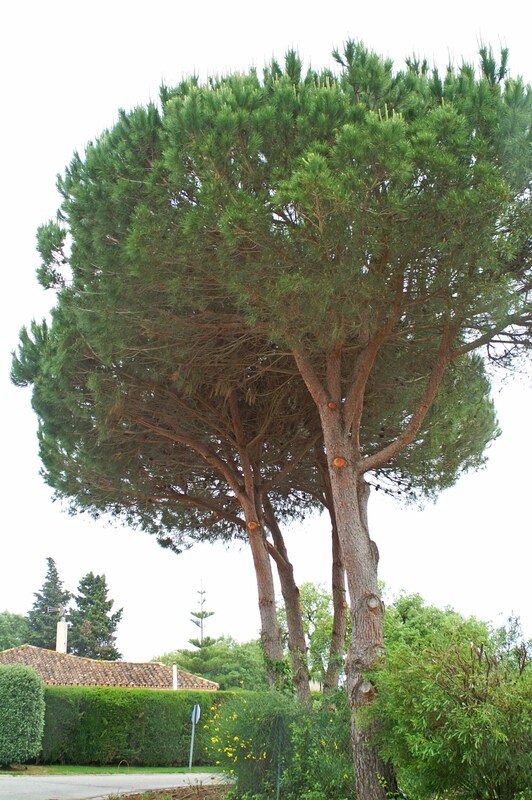 Although probably not a true native of the eastern Mediterranean, it has been and is still frequently planted and mature, pure stands of the trees may be found in coastal habitats and in the hills. 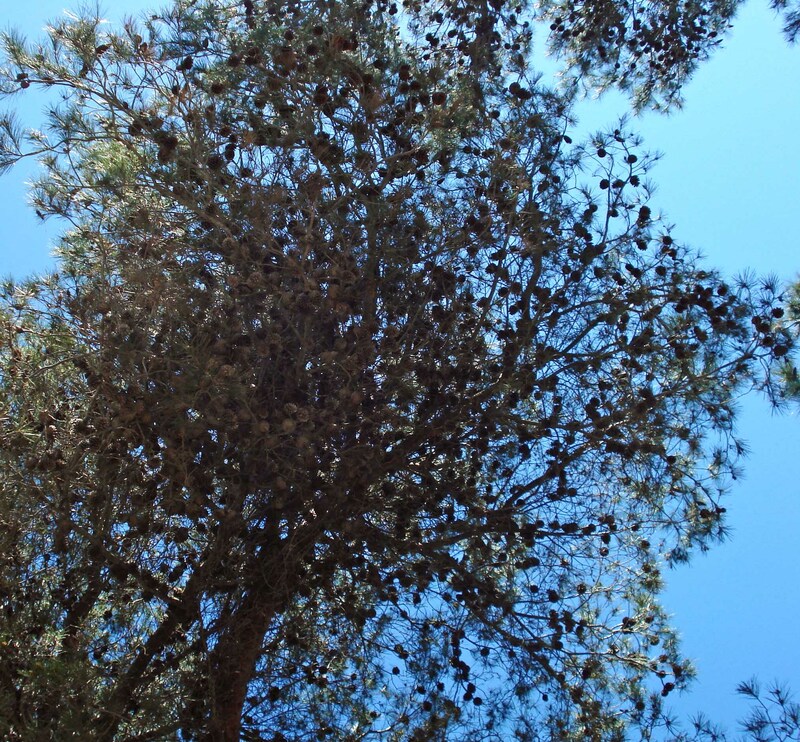 There are some lovely specimens of the trees growing in Sotogrande, and more at Alcaidesa, but locally the best place to experience them in a more natural setting is the old forest of Pinar del Rey, near SanRoque. There are also some lovely stands of the trees along the Atlantic coast behind the beaches of Tarifa. 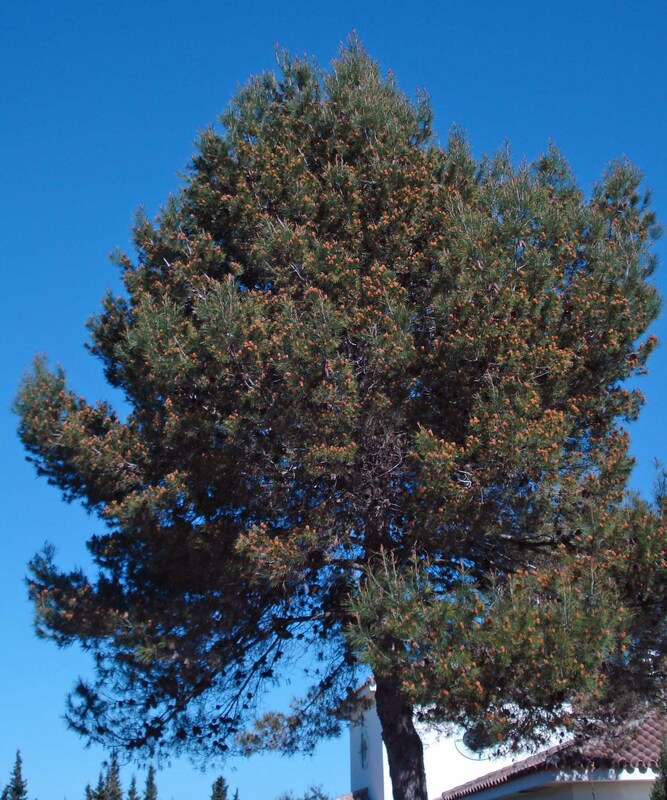 A non-native pine tree that originates from the Canary Island and is very widely cultivated throughout the region. 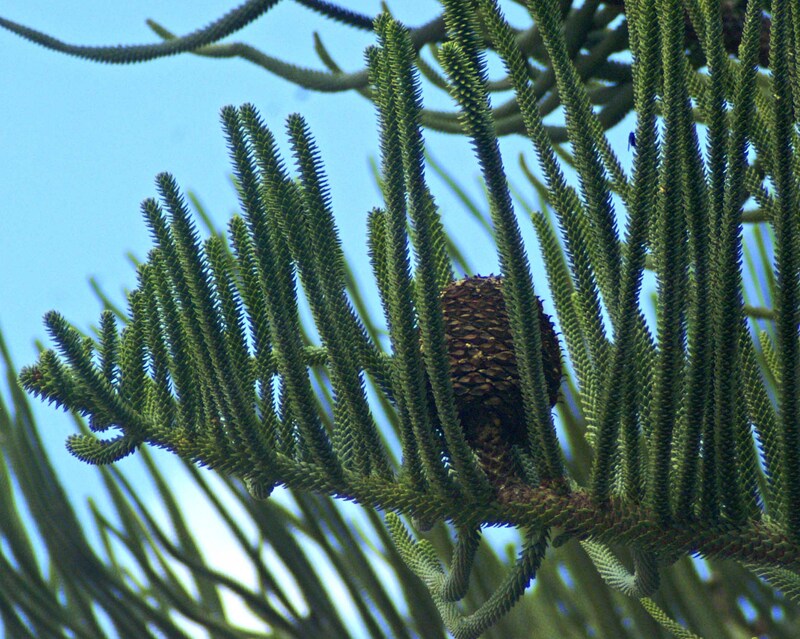 It is characterised by its very long leaves, or needles, which are 25-30cm long, and by the enormous cones that it bears, which are much sought-after and collected for use as fire-lighters. 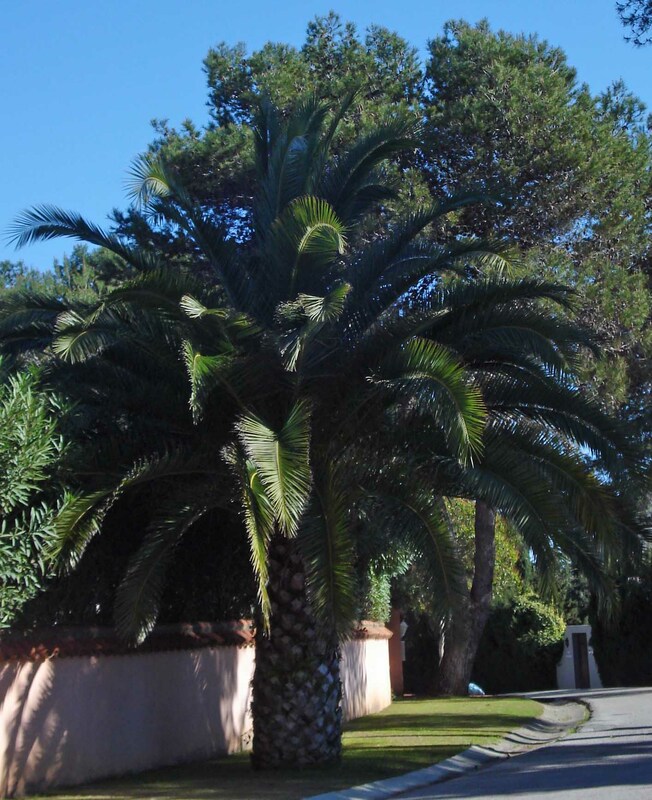 There are some very large examples of these trees planted along the roadsides of Sotogrande, most of which have their lower branches removed fairly regularly. Unusually, where branches are cut from the trunk, new growth sprouts. 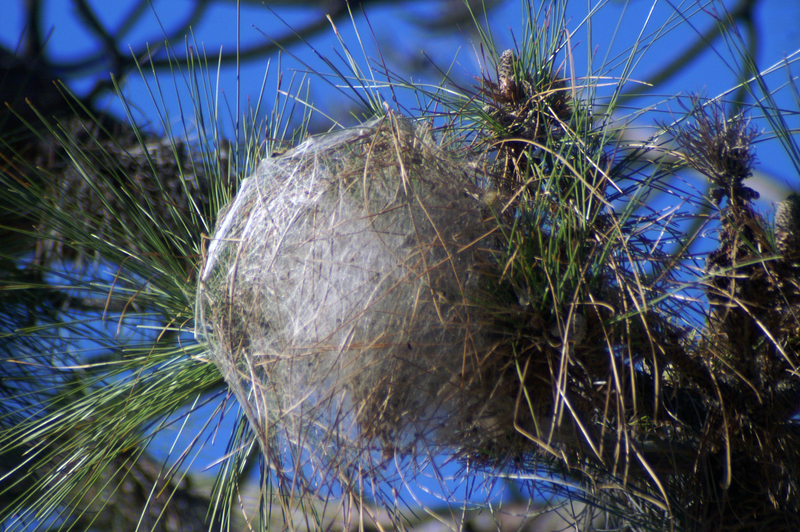 Processionary Moths often select the tops of these particular pines in which to construct the silken 'tents' that house their gregarious larvae. 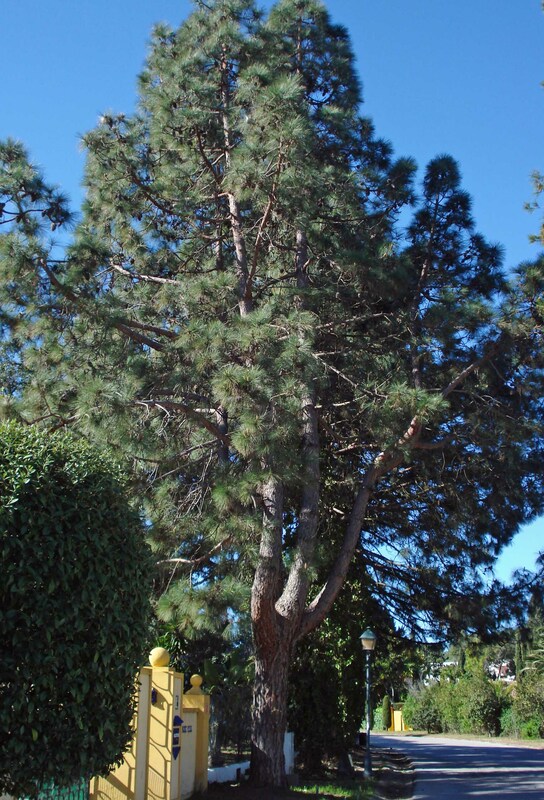 The Monterey Pine is another widely planted non-native, which as its common name suggests, is from California, SW USA. The Latin name, ‘radiata’, indicates the characteristic way in which the branches grow: they radiate out at more-or less the same level, in varying numbers (I’ve counted as many as six), like the spokes of a wheel, the radiations spaced at intervals up the trunk. The mature tree has a domed or flattened crown and spreading branches, the lower ones sometimes drooping. The leaves of this species are grouped in threes, each 15cm long. 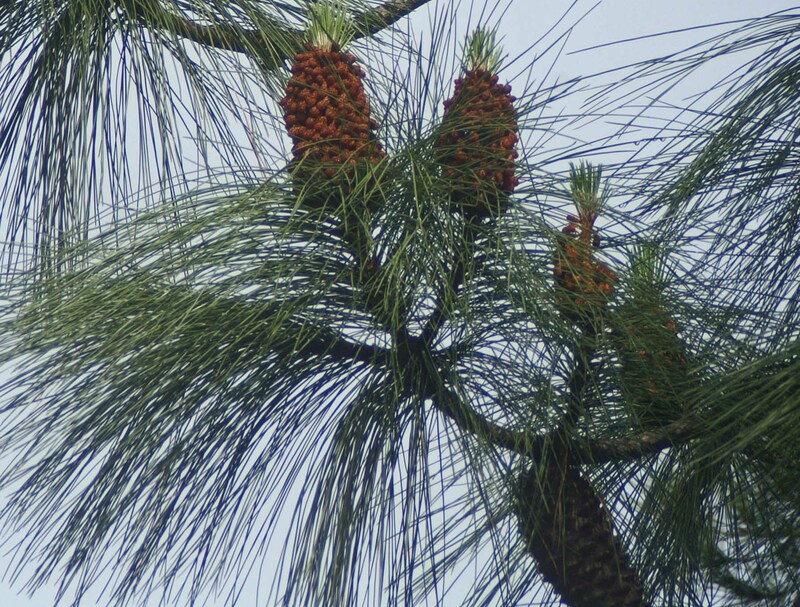 The cones are ovoid and markedly asymmetrical. 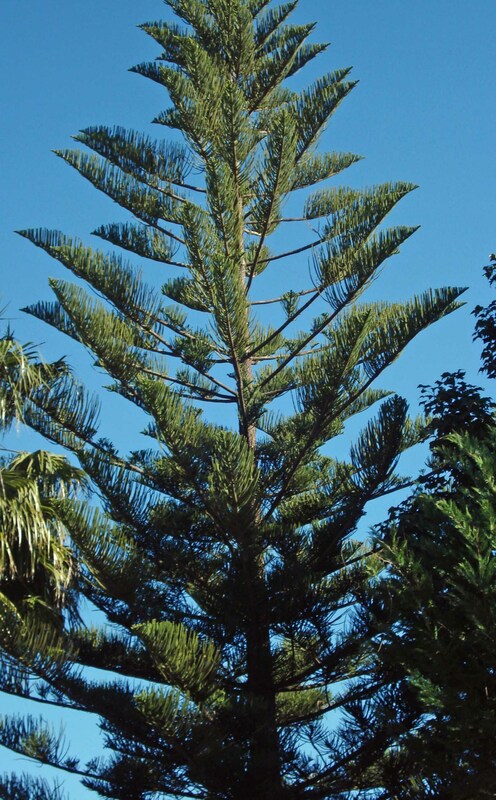 The Norfolk Island Pine, native to the New Zealand island of its name, is a very distinctive tree that has palm-frond like side branches comprising upward-pointed shoots arising from a lateral branch. The stem is tall and slender. 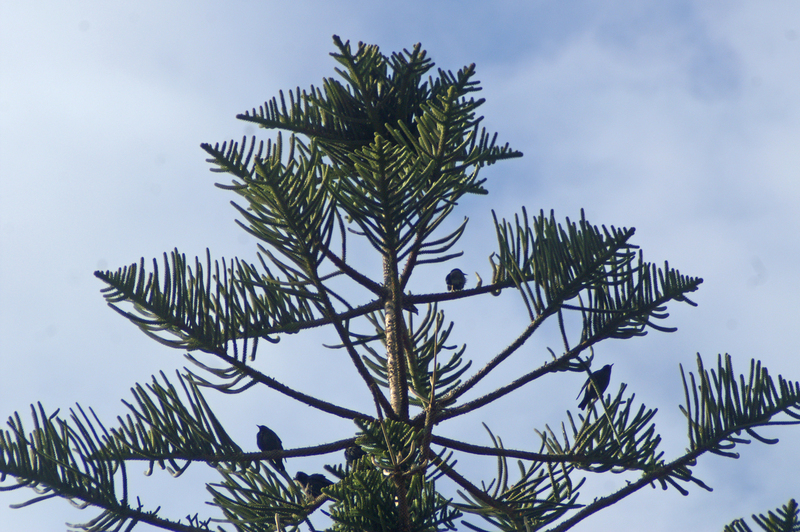 The big Norfolk Island Pine, planted near the entrance to the Reserve is a favourite place of Spotless Starlings, and their tuneful songs and whistles are often heard from there. They use the tree as a night-time roost, too. 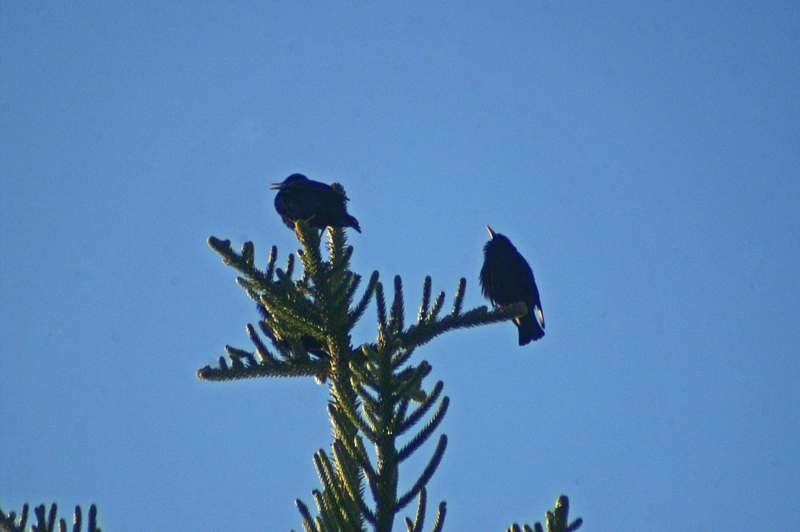 More Spotless Starlings; these two, at the top of another local tree are singing before bedtime. Shrubs or trees whose stems may or may not be branched. The leaves are large, pinnately – or palmately- divided and the flowers, borne in large inflorescences are small, clustered in long spikes or panicles. The fruits may be berries or drupes. Canary Palms, with their dead leaves pruned to leave a ‘pineapple’ effect to the trunks and huge dark green leaves are one of the most widely planted and familiar palms grown along the coast. The large fruits, often produced in large quantities are usually dark yellow-orange, and as far as I know are not edible. Sadly, in recent years many of these lovely trees have been killed and many more badly affected by the invasion of a voracious species of beetle, the palm weevil. 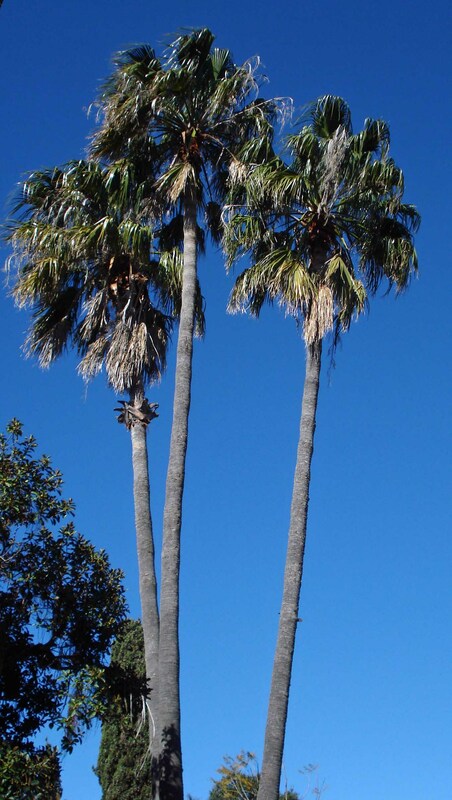 A native of Mexico, this is another very familiar species of palm having distinctive long, slim and very tall trunks crowned with huge fan-shaped leaves that get shredded into streamers by the wind. Preserving the groomed look of these trees takes a lot of maintenance and many are pruned, or ‘cleaned’ as they say in Spain, every year or so. Those planted along roads are dealt with by men lifted on mechanical platforms mounted on the back of a truck, but in gardens it’s not so easy. The trees in our garden bear the marks of being climbed by a man wearing spiked devices that were strapped over his shoes; he would have hauled himself up the trunks with a sling-like belt slung around the tree and counterbalanced himself against it. A more sophisticated alternative, used by some professional pruners, takes the form of a self-propelled hydraulic lifting platform; either way they need strength and a good head for heights. Left in a natural state the dry, dead leaves remain attached to the trunk, earning the tree one of its alternative names of Petticoat Palm. In this form the tree is much more attractive and useful to birds as it offers them cover and gives shelter to insects for them to eat.The fruits are tiny berries that turn black when fully ripe and provide a long-lasting feast for Blackbirds and Blackcaps.